More than 30 years after they left Earth, NASA's twin Voyager probes are now at the edge of the solar system. Not only that, they're still working. And with each passing day they are beaming back a messages any one of which could contain an unextected discovery about the cosmos. "It's uncanny," says Ed Stone of the California Institute of Technology in Pasadena, Voyager Project Scientist since 1972. "Voyager 1 and 2 have a knack for making discoveries." Today, April 28, 2011, NASA held a live briefing to reflect on what the Voyager mission has accomplished — and to preview what lies ahead as the probes prepare to enter the realm of interstellar space in our Milky Way galaxy. "Each of these discoveries changed the way we thought of other worlds," says Stone. The Voyagers are trying to get out, but they're not there yet. To locate them, Stone peers back into the sink: "As the water [or solar wind] expands, it gets thinner and thinner, and it can't push as hard. Abruptly, a sluggish, turbulent ring forms. That outer ring is the heliosheath — and that is where the Voyagers are now." "In many ways, the heliosheath is not like our models predicted," says Stone. In June 2010, Voyager 1 beamed back a startling number: zero. That's the outward velocity of the solar wind where the probe is now. No one thinks the solar wind has completely stopped; it may have just turned a corner. But which way? 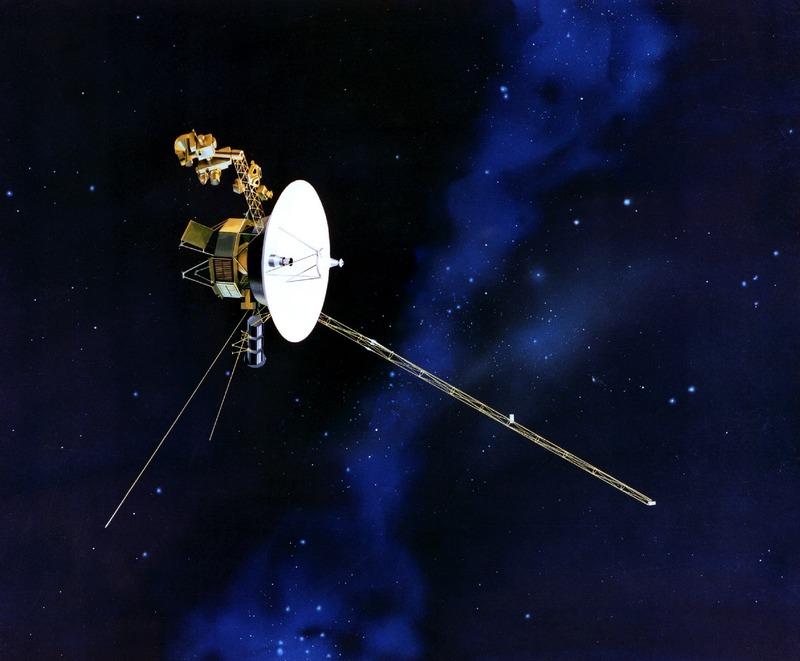 Voyager 1 is trying to figure that out through a series of "weather vane" maneuvers, in which the spacecraft turns itself in a different direction to track the local breeze. The old spacecraft still has some moves left, it seems. Each probe is famously equipped with a Golden Record, literally, a gold-coated copper phonograph record. It contains 118 photographs of Earth; 90 minutes of the world's greatest music; an audio essay entitled Sounds of Earth (featuring everything from burbling mud pots to barking dogs to a roaring Saturn 5 liftoff); greetings in 55 human languages and one whale language; the brain waves of a young woman in love; and salutations from the secretary general of the United Nations. A team led by Carl Sagan assembled the record as a message to possible extraterrestrial civilizations that might encounter the spacecraft. 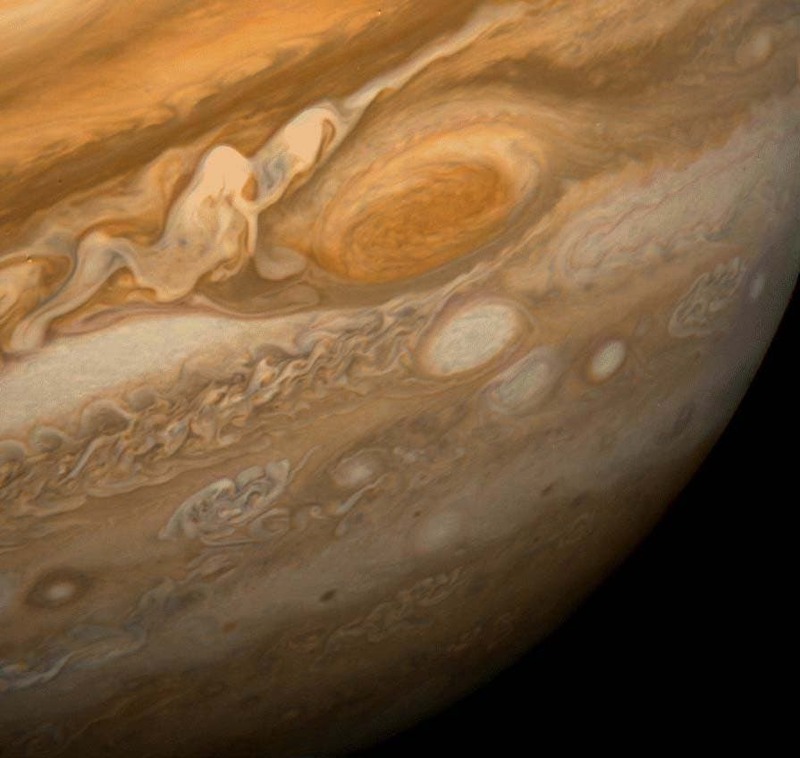 The image below is a historic Voyager image of Jupiter's Great Red Spot.